Scrambling around in the pitch black of night desperately trying to not wake my roommate or the family we were staying with, my alarm was piercing the silent night air. The excitement was palpable. 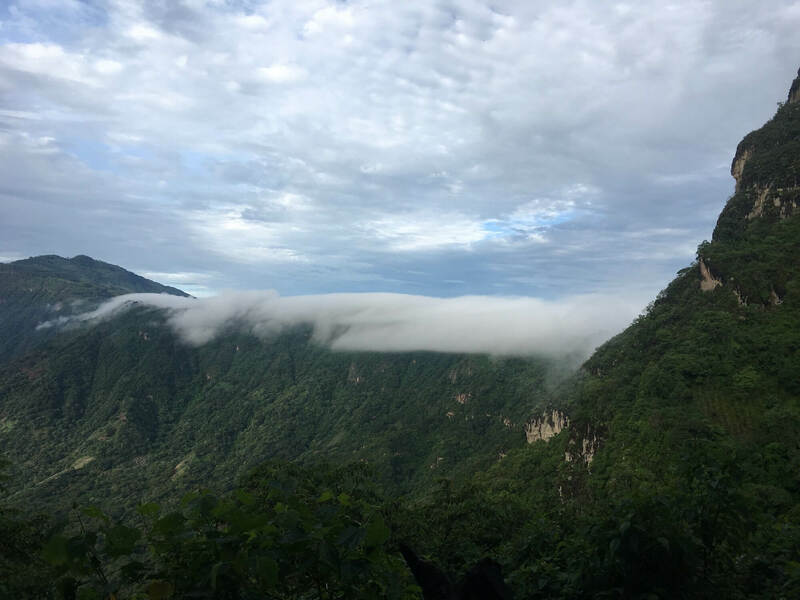 I have come to love my hiking holidays and my time in Guatemala had so far been light on hiking. This morning I was about to hike one of Lake Atitlán’s peaks. Sunrise is always a magical time of the day, even more so when witnessing it first hand in one of nature’s most beautiful settings. This morning I was about to hike Lake Atitlán’s Indian Nose. 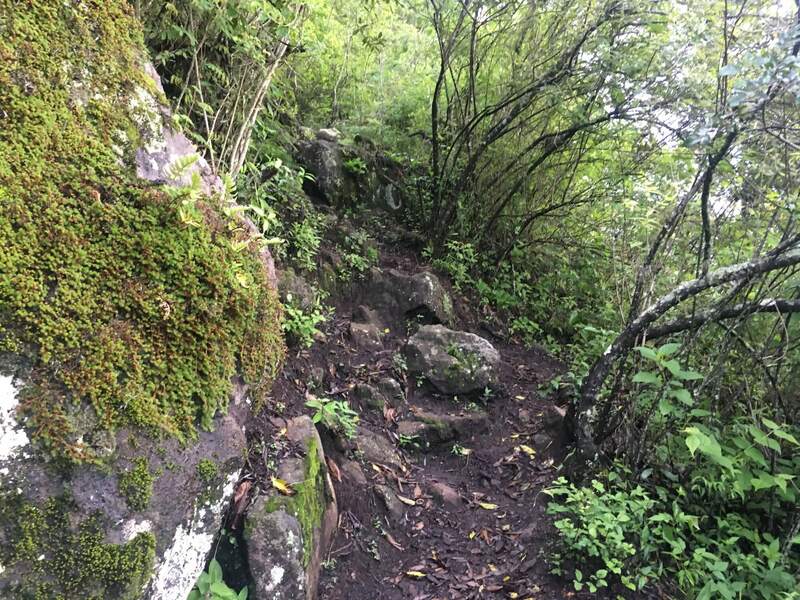 It doesn’t perhaps have the appeal as nearby San Pedro Volcano but Indian Nose is a quicker climb. 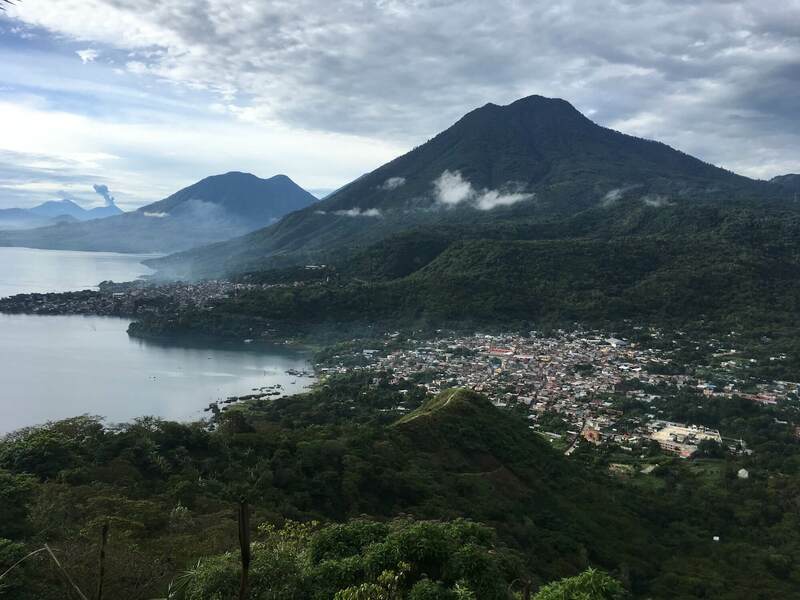 If you are short on time but still want to witness a sunrise over Lake Atitlán and the trail to San Pedro is closed, Indian Nose is just as spectacular. Indian Nose clearly visible in the morning from San Juan back to Panajachel. Afternoons here can be famously cloudy. The early morning air was crisp. It was only just gone 3am after all. As my host and I made our way quietly through the streets of San Juan to meet up with my guide for the morning, the street dogs that are prevalent all around town announced our arrival with a chorus of barks. So much for a stealthily quiet start to the morning. If you stay in town, your guide will meet you at the most central spot in town, the school yard. On wet days there is some cover for you to shelter under while you wait for your guide and any other participants. If you arrive on a pre arranged excursion from another town you will start from the dockside. Starting off down through the winding streets of town, the first 15 minutes of semi paved roads with a canine following are easy going. It’s not until you get to the edge of town and start climbing that you realise you are already at altitude. The lake of Atitlán is already over a kilometer and a half above sea level. The trail from town soon starts gaining altitude. In the dead black of night it’s very difficult to make out much ahead of what’s in front of you. To the left and right, not that you will be able to make them out until your return, are fields of coffee. A staple product of the area, the steep terraces are where the farmers make their living. Their hours are long and arduous yet they still stop and offer a smile to trek weary hikers on their return. Take care on the smooth well trodden stairs. They can be like walking on ice. Fields of coffee crops soon give way to nature as the climbing gets steeper. Certain sections of the trail (it would be too kind to call it a path) have been washed away. Only on my return did I realise how narrow certain sections actually are. A couple hours in and you are surrounded by tall trees, all jostling for their own space on the precipitous sides of the mountain. 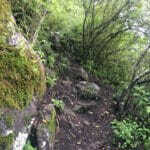 Some sections of the trail require the use of climbing aids. 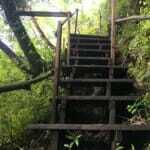 You will come across a fair few sets of stairs on your ascent. While they do make the going easier, particularly on muddy sections, be aware they can cause problems of their own. 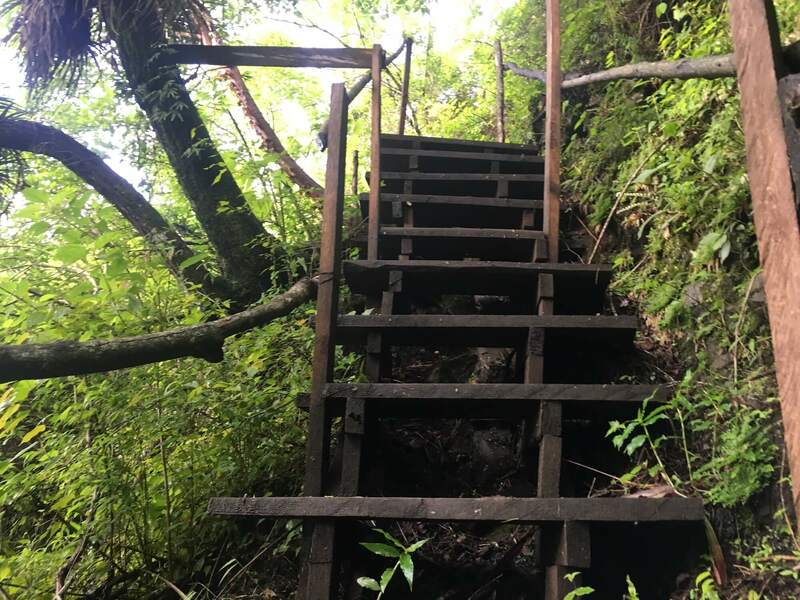 Steps are uneven and they’re not the sturdiest staircases you will come across. The climb to the top isn’t the most strenuous hike i’ve ever done but if you are either new to hiking or doing anything at a slight altitude then you will be glad of some rest stops. Indian Nose has 2 main rest stops on your way to the top. Use them to your advantage. Grab 5 minutes to sit down and catch your breath. The humidity can be punishing, make sure you bring some water to drink. At least a couple of litres. The muddy trail makes the going tougher than it should be while natural obstacles keep things interesting to ease the boredom of night time hiking. With a moderate pace you should have no problem reaching the summit in plenty of time to rest up ahead of sunrise. The humidity may be high but sitting exposed on the peak of Indian Nose for over an hour can get quite chilly as the early morning breeze whips around the exposed peak. With only 2 of us managing the extra early start, sitting up there in silence as the world slowly woke around us, was a magical way to start a day. The dark of night slowly gives way to one of the deepest blues in the natural world as the sun nears the horizon. The frequent breeze washes in cloud cover almost instantly as the air and ground temperatures change drastically in the seconds around sunrise. Sunrise over Lake Atitlán is quite simply a mesmerising sight. The well trodden trail out of town soon leads to not much more than a muddy track held together by roots of trees. The weather around Lake Atitlán is famously changeable but even when sunrise is obscured by cloud, like it was on my visit, it’s easy to see why this area has been described as “Eden On Earth” and compared to Lake Como. 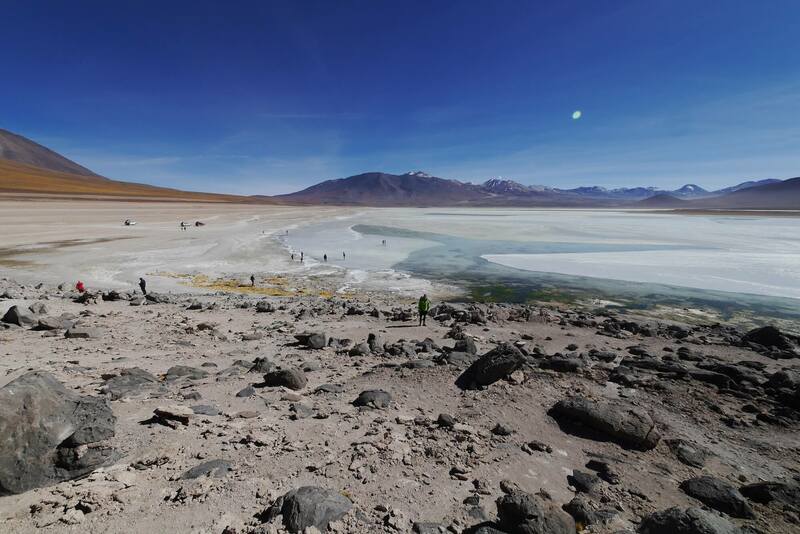 With the 130 square kilometre lake and thin whisps of cloud billowing below you, you certainly feel on top of the world from your silent vantage point. All too often when hiking it is time to leave the focus of your hike before you are ready. Not so with sunrise over Indian Nose. We were never rushed. Our guide was happy for us to stay as long as we liked. After an hour sitting, contemplating our achievement and drinking in the beautiful scenery we felt it was time to leave. Our return boat was booked for mid morning and our hosts had promised us a goodbye breakfast on our return. The return hike down the exact same path presents a fresh set of challenges. In the bright light of day precipitous drop offs and the steepness of the stairs make for an entertaining return. It’s like hiking 2 separate trails. The views over San Juan on the way back down are as spectacular as those at peak. Looking down on San Juan la Laguna with the the town of San Pedro and the San Pedro Volcano in the distance. While it’s perfectly possible to hike Indian Nose without a guide, isnt the whole point of travel to connect with new cultures and communities? Share ideas, enjoy company, make new friends and bring the world together one step at a time. Staying with a family and hiring a local guide to hike up Indian Nose does exactly that. You can see where the money that you spend is benefitting the local community, not just the people you are in direct contact with. At the same time you will be able to witness one of the most uniqely beautiful sunrises on this planet. Waves of clouds surround us as the day draws brighter. A marvellous start to any day.